Do you struggle with the removal of stubborn spots, water streaks and grime build-ups from your windows? Do they cost you too much energy and you have no will to take part in this household task? This process will no longer consume a big chunk of your time and efforts! The experts of window cleaning in Seven Sisters are going to help you out! You will be able to use your leisure time as you wish – the fully instructed and dependable team members will take care of the washing and cleaning. We offer thorough cleaning services for all types of glass surfaces. Read on and discover more about the different benefits you can enjoy. We also provide our professional services in nearby areas: Stamford Hill, South Tottenham, Lower Clapton, Newham, Acton. 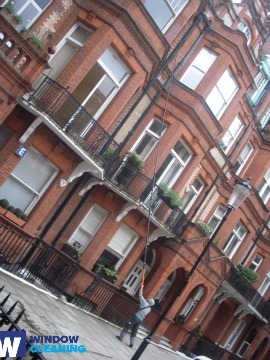 We provide first class window cleaning by using latest equipment. We provide impeccable and pristine look for your glass surfaces, roof windows and conservatories with water-fed cleaning system and high pressure cleaning. The poles we use are connected to water reservoirs in our vans, thus eliminating the risk of damage to the exterior of your home or business premise. In addition, we use totally safe rope access techniques to clean glasses on high-rise buildings. You can benefit from these techniques instantly – phone us on 020 3746 3113! You can enjoy perfectly looking workplace with the help of the experts of commercial window cleaning. You can depend on our first-class services for all types of business premises. For instance, if you own a small shop, we can completely wash its windows by using our water fed extension pole equipment – it allows us to as high as the fourth floor. If you seek pristine look for the glass panes of a tall business property in London and the surrounding areas, we will make use of our rope access equipment. In both cases, you will enjoy excellent results right away. With our professionalism and technical expertise, you can depend on us for household and business window cleaning. Your property will look perfect after the service, regardless what kind of windows you have. We clean small, French doors, sash or double windows, bay windows and patio doors. Moreover, we clean garden windows, skylights and conservatories. In other words, you can count on us for complete cleaning of your windows, including the framework and sills. You will be proud of your absolutely clean home after the best window cleaners in Seven Sisters visit you. We provide the best services for the entire London locality. The most advanced ways of cleaning are included in our working procedures – including water-fed extension pole system and and hard pressure cleaning. You will see for sure the change domestic hygiene – we use purified water for the process of in and outside window washing. Call us now on 020 3746 3113. Our customer representatives will help you and answer your inquiries. Or you can use our on-site booking from.